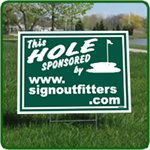 24'' wide x 18'' tall Golf Hole Sponsor Sign. Golf Hole Sponsor Sign. 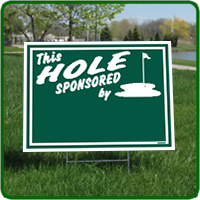 Hole sponsor designs digitally printed on White Corrugated Plastic. Sign is imprinted on one side. Green imprint on a white sign. Legend: This Hole Sponsored by (with golf green and flag). 24'' wide x 18'' tall Golf Hole Sponsor Sign. Includes sign stake. Golf Hole Sponsor Sign. White corrugated plastic sign with white border and Green Imprint. Sign is imprinted on one side. Green imprint on a white sign.